The Media Streamer Plus has a micro-USB 2.0 port that is used for charging the device or connecting it to a computer. There are also two USB 2.0 ports. 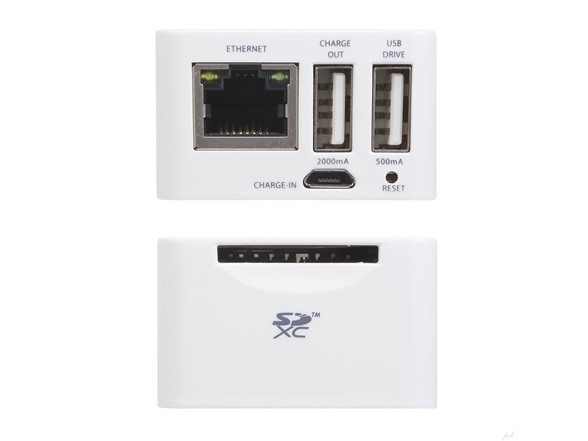 One of these ports can be used to charge external devices that are connected to the Media Streamer Plus, as well as to connect an external USB drive, while the other can only be used to charge external devices. The device also features an SD card slot; when connected to a computer, the Media Streamer Plus can also be used as an SD card reader. The Media Streamer Plus allows you to wirelessly extend your mobile storage space. Once you have uploaded content from your smartphone or tablet, not only have you freed up space on that device, but you can also wirelessly access the data on the Media Streamer. The built-in 5200mAh battery allows up to 10 hours of playback time, up to 16 hours of WiFi operation, up to 32 hours of WiFi standby time, and up to 6 hours of use for charging external devices. Using either an SD card or USB drive, the Media Streamer Plus lets you upload and download content. Using the Media Streamer app, you can upload contacts, images, and videos from your smartphone or tablet and store them on the USB drive or SD card that is plugged into the Media Streamer Plus. The number of personal electronic devices that surround us is only going up. While it makes life easier and more fun, storing and sharing all our accumulated photos, videos, music, movies and more is becoming increasingly inconvenient. 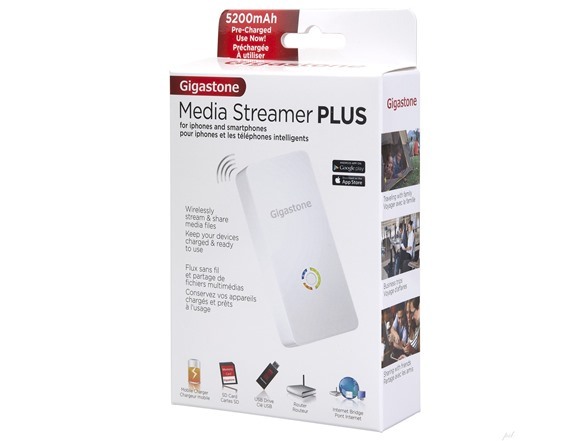 Enter the Media Streamer Plus from Gigastone, a leader in flash and portable memory. The Media Streamer Plus removes all the physical boundaries that keep you from really enjoying your media the way you want to. It reads data stored on your SD cards and USB drives, and then wirelessly streams it in real time to as many as 6 portable devices at once. With its capabilities o transferring files to and from SD cards, USB drives smartphones, tablets and more, the Media Streamer Plus opens up a world of new storage and file transfer possibilities for owners of any mobile device. Not only can you instantly transfer media between your iOS and Android devices, you can actually make a reliable backup of your most important data from your mobile devices onto SD cards, USB HDDs, or thumb drives. Now you can keep all your photos, videos, contacts, music and more. Safely stored without ever needing to delete anything due to a lack of storage space. 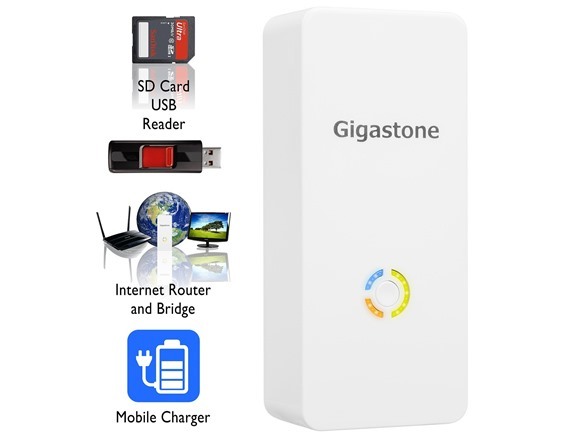 Gigastone’s Media Streamer Plus also packs another few impressive capabilities that put it head and shoulders above competing products. 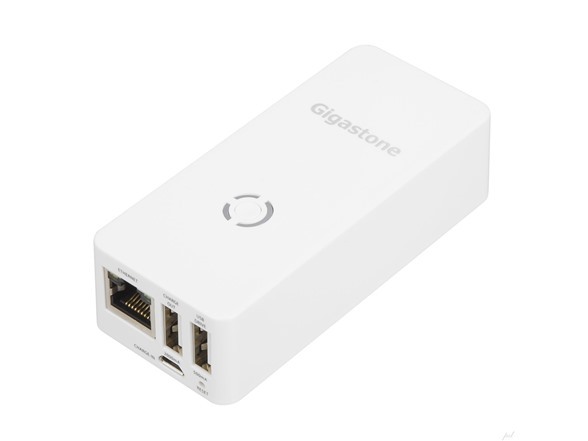 These include an Ethernet port, which allows you to 1) quickly and easily convert your hardwired modem access point into a wireless home Wi-Fi network, and 2) simultaneously use up to 6 devices to surf the Internet AND access any data on the SD card or HDD that’s connected to the Media Streamer Plus. 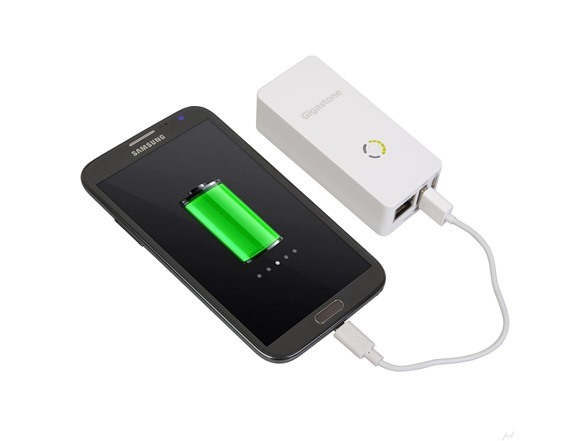 Last but certainly not least, a huge 5200mAh internal battery pack provides charging juice for your smartphone and other mobile devices on the go. Box Dimensions (LxWxH) 6.0 x 3.8 x 1.3"